Selena Crace presented a check to the Huber Heights Rotary Club for $569 for the clean drinking water project for Rotary International that the Interact Club raised during their spring blitzes. HUBER HEIGHTS — Interact is a service club for young people ages 14-18. Sponsored by local Rotary clubs, Interact clubs give young people an opportunity to participate in fun, meaningful service projects while developing leadership skills and meeting new friends. 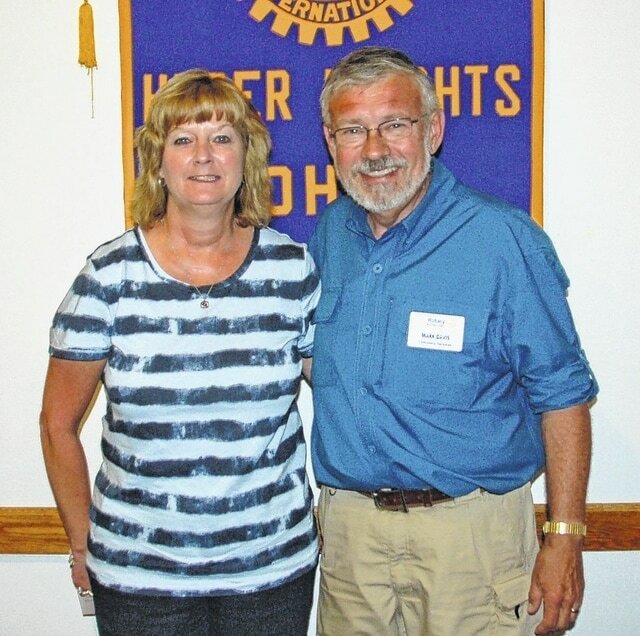 Wayne High School Interact Club supervisor Selena Crace spoke at the Huber Heights Rotary Club on June 22 concerning the activities and service performed by the local club this year. During the year, the Wayne Interact Club volunteered at the community dinners held at the Forge on Fishburg Rd. According to Crace, the students set tables, served food, drinks and deserts and assisted with clean-up. They also volunteered at “The Locker” — a free clothing store which is operated by Sulphur Grove United Methodist Church on the lower level of Studebaker, the site of the Huber Heights City Schools Board of Education. At “The Locker” students sorted clothing donations and displayed them in the shopping areas. In October, Interact held a candy drive for Dayton Children’s Hospital as well as the Ronald McDonald House. “All candy was donated and we were able to deliver 50 Halloween buckets,” said Crace. In November, January, March and May, Interact sponsored the staff appreciation monthly treats at Wayne. Crace said that students wrote messages of thanks and support to the Wayne staff and attached the notes to a candy treat. In December, Interact assisted the Huber Heights Rotary Club by shopping for Christmas gifts with funds raised by the Rotary Club for local families in need. Members of the Interact Club also wrapped the Christmas gifts. In April, Interact held a neighborhood food drive. Each member collected food donations in their neighborhoods. The Interact Club delivered over 200 pounds of food to the Huber Heights FISH Pantry. “The Interact students clearly projected the ‘Service Before Self Motto’ this year by donating over 1080 hours of their time to their school and community,” concluded Crace.